​It is the mission of the Isleta Pueblo Housing Authority to provide opportunities to all responsible eligible tribal members to own safe, sanitary and affordable housing developed utilizing traditional Pueblo designs that are environmentally sound, in an environment which preserves the Isleta customs and traditional values and will promote and develop affordable quality housing opportunities; promote and establish homeownership opportunities; operate an efficient and effective housing program; improve and strengthen customer support to residents; and promote tribal economic growth through capital financing to improve housing opportunities. The IPHA has been in existence since 1996 when Isleta Pueblo, along with other Pueblos, removed itself from the All Indian Pueblo Housing Authority (AIPHA). The Isleta Pueblo Housing Authority operates under an Ordinance adopted by the Tribal Council in 1996. Under this Ordinance, A Board of Commissioners is identified as the governing body for the IPHA. In December 2010, Tribal Council established a five member Board of Commissioners of the IPHA. The IPHA is a separate legal entity with is own federal tax identification number and a set of laws (the “Ordinance”) which sets forth its powers, authorities and limitations, and governs its activities. 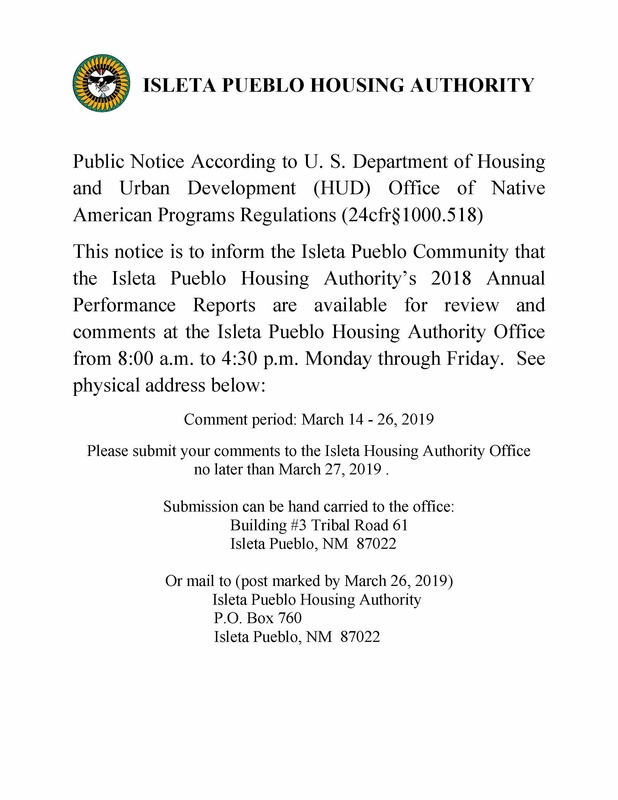 Isleta Pueblo Housing Authority (IPHA) maintains a waiting list which must be updated periodically for federally assisted (HUD) housing. Assistance is available for new home construction, rehabilitation and renovation. Ask for home ownership consultant for more information. IPHA provides maintenance and repair services on a called-in work order basis. Services include but are not limited to seasonal services (a/c and furnace), heating, plumbing, electrical, sewer backups window and door replacement. Roof repairs are on a contract basis. Participants may be eligible for free services or a re-payment agreement. Participant will need to contact IPHA to establish eligibility. IHPA has the capacity through our architectural office for the design of Americans with Disabilities Act (ADA) compliant new homes and renovation designs. Services also include environmental assessments, abatement, soil testing and site development. The Isleta Pueblo Housing Authority is accepting applications for the FYI 2017 Home Improvement Program (HIP) for safety or sanitation repairs, renovations, and replacement of a home for substandard dwellings. Applications are available at the Isleta Pueblo Housing Authority Office. After submission of the application with all required documentations it will be determined if you meet the “eligible” criteria for the HIP Program. Most Important: Proof of ownership to either the existing home and/or land. If you have any questions or need assistance, please contact Bernadette Lente, Executive Assistant at (505) 869-4153 Ext. 9345. ​The Homeownership Counseling Program (HOC) is continuously accepting applications to provide safe, decent, and sanitary housing assistance which is managed consistent with applicable federal laws and regulations. Must update Admission’s Application every three (3) years to be eligible to remain on the Waiting List meeting all requirements.